Summer is in full swing and our garden is rewarding us for the work that we have put in so far. Part of our reward is rows of beautiful, fresh lettuce. We planted two different types of lettuce and ended up having some the lettuce that we neglected last year go to seed and grow again this year (yeah for free food!). We did plant the lettuce in two separate plantings that were spaced a couple of weeks apart. We hoped that would keep us from getting everything all at once. At this point in the summer, the succession plantings don’t really mean much, so we have lots of lettuce. The challenge with too much lettuce is that we have yet to find a really good way to preserve lettuce for longer term storage. Our heartier greens are no problem, those can be wilted down and frozen, but lettuce needs to be eaten pretty soon after harvest. 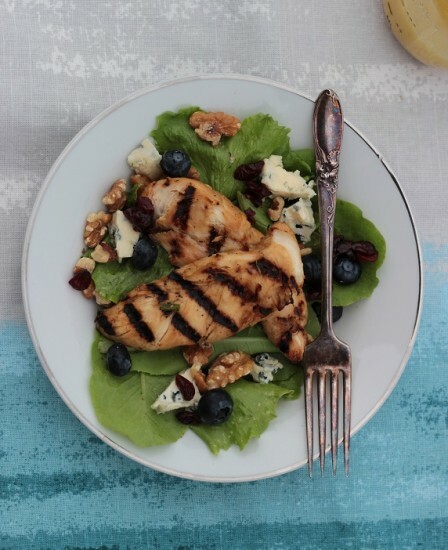 That brings us to tonight’s dinner, we were scheduled to make one of our newer favorites – grilled honey jalapeno chicken. I have been thinking about using leftover chicken from this recipe on salad since the first time we made it. The problem is that we have not had any leftovers so my salad had to wait. Since we had all of this wonderful lettuce in the garden, I called an audible and decided that we were making the chicken to satisfy my salad desires. While the chicken was marinating and the grill was coming up to temperature I began harvesting the lettuce from the garden. As the chicken was cooking I had my lovely wife make a citrus vinaigrette and my oldest offspring clean and dry the lettuce. I have found that a salad spinner is the best way to get the lettuce dry. We added some cheese, bleu cheese for me, cheddar for the wife and children and added some fresh blueberries and dried cranberries as well as some walnuts. Within a few minutes we all had a great salad sitting in front of us. Even the kids cleaned their plates. We ruled these as a great success and will make again. Mix together the honey, soy sauce, olive oil, garlic, jalapeño, lemon zest, salt and pepper. Add chicken and coat thoroughly. Allow to marinate for 30 minutes, or up to 8 hours. Oil grill and cook until juices run clear. You can adjust the amount of jalapeño to suit your own tastes.